Do hydrogen-powered cars really have a place in today’s — or tomorrow’s — motoring landscape and what are they like to live with? As you may know, Autocar was first published in 1895 when Henry Sturmey, founder of The Cyclist, a popular journal dedicated to pedal power, noticed the arrival of cars on the carriageways around Coventry. He was certain these newfangled contraptions had a future and, within a week, he launched a pamphlet on the subject. Autocar was born. What is most astonishing about Sturmey’s prescience is that he made this leap of faith at such an early stage in the evolution of the car. Accurate records are hard to find, but it seems likely that you wouldn’t have needed to go much beyond your fingers, thumbs and toes had you been counting the total number of cars on UK roads at the time. Over the 120 or so years since, Sturmey’s reputation as a visionary has been cemented. 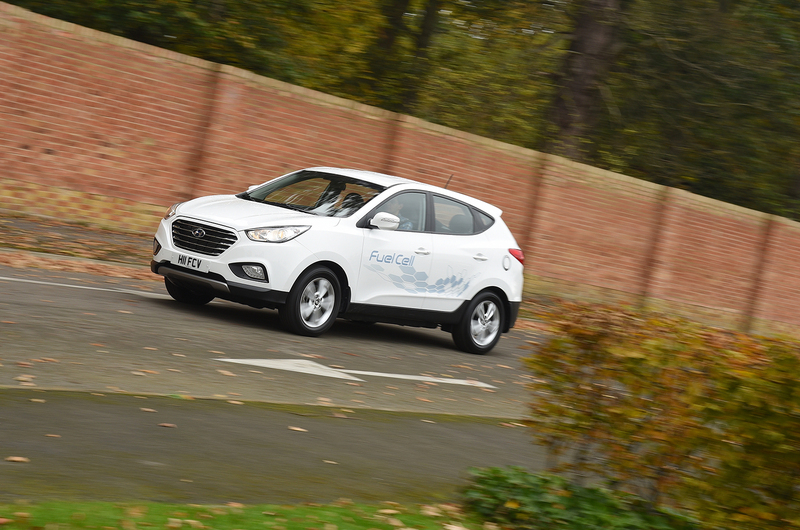 Where that ties in here is with our decision to take the plunge and become the first journal in the UK – and possibly the world – to run a hydrogen-powered car on its test fleet. Over the next few months we will tackle head on the many debates to be had around why we have selected a left-hand-drive car based on a superseded model – and one that costs more than £50,000. For now, though, suffice to say that all of the answers lie in wonderment at the powertrain and what it can do for car enthusiasts today and for the future. As a result, we’d scarcely be more excited had a LaFerrari joined our fleet. What the Hyundai lacks in hypercar looks and performance, it makes up for in the truly futuristic technology that is housed towards the rear of the car and under the bonnet. At the back – fore and aft of the rear axle – sit two gas cylinders in place of a conventional petrol tank, home to 144 litres of compressed hydrogen when full. To the front sits a fuel cell, and the hybrid battery packs are located under the vehicle. The cleverest bit is under the bonnet, and as I type this description, I have my fingers crossed that I was concentrating while studying for my GCSEs. Inside the fuel cell sits an anode, a cathode and a polymer electrolyte membrane. When the hydrogen flows over the anode, it splits into hydrogen protons and electrons. The polymer electrolyte membrane allows only the protons to pass through. The electrons travel to an external circuit that operates the motor. At the cathode, electrons and protons react with oxygen from the air to create water – the only tailpipe emission from the process, and famously pure enough to drink. The batteries are mainly there to boost energy at periods of peak demand. My cause is greatly helped by the location of one of the country’s few hydrogen refuelling stations in Teddington, Middlesex, down the road from where Autocar is based. However, the infrastructure is improving and the car’s realistic range of 280 miles between fill-ups (as opposed to the 369 miles Hyundai is forced to declare by governmental regulation) makes getting around pretty simple. While Land’s End to John O’Groats would be a challenge, it’s a blackspot in the north of England – after Sheffield – that is the major problem. From London, it shouldn’t be a problem to head south, east or west, or to get around if I can sneak it up into Scotland. Planning will be key. If I want to visit my in-laws in Pembrokeshire, it should be possible, with refuelling stops on the M4 in Swindon and Swansea ensuring I can get around when I’m there and make it back again. I’m told London to Paris and back should be a doddle, too. I hope to test both. But it’ll mean signing up to the various fuel suppliers and learning the intricacies of their fuelling systems. To date, all have been simple to use but slightly different; such is the price of being a pioneer. There’s little to no risk of being stranded, as long as I do plan well. With fewer than 100 hydrogen-powered cars on UK roads and a refill taking around three minutes, there’s no threat of lengthy delays waiting for another car to move on so I can top up. To my mind, and writing as the owner of a Renault Zoe, the risk of finding all available charging points occupied is a bigger deterrent to long-distance travel in a batterypowered EV than any range anxiety. Beyond that, the ix35 is remarkably normal aside from a slight upward bump in the boot (space is down to 436 litres, from 591) to accommodate the hydrogen tank, the steering wheel being on the wrong side, some different instrument readouts and graphics, and a few other subtle styling changes, the most obvious of which are those stickers, which do not come as standard. It is even remarkably normal to drive and use, in the way of all electric cars, with impressive initial acceleration followed by adequate but average power delivery as the limitations of the electric motors kick in and the extra weight of the powertrain (around 100kg over a diesel here) count. For the record, the ix35 is just over 1.5sec slower than a 2.0-litre diesel to 62mph and tops out at about 100mph. Torque is rated at 221lb ft. It’s enough. This is a normal, practical, everyday car with a remarkable powertrain, then. Will hydrogen power prove to be as significant as the arrival of the car itself? As I wrote, Sturmey made his decision on the impact of cars within a few days of first seeing one, so a couple of months should be plenty of time to draw some meaningful conclusions. Why so much focus on range? Why so much focus on range? Is it really relevant for 80+ of drivers? We live in world where drivers are deleting DPFs and EGR valves because they don't drive the distances that let them work properly. The tech is interesting but I suspect that a future where home delivered hydrogen supplying a fuel cell that charges your pure or hybrid or EV as well as running your home. Although I have seen suggestions that the car may end up being used as a mobile battery instead. Range and refuel time is important to many drivers - maybe city commuters have no issue but the rest of us do. Deleting the DPF because of short distance use is a case of buying the wrong car - should have bought a petrol. My point is that range is unimportant to many drivers you view yourself in the majority when every single piece of research indicates that 70-80% of drivers drive less than 40 miles per day. So again why focus on an issue that affects so few? "I suspect that a future where home delivered hydrogen supplying a fuel cell that charges your pure or hybrid or EV as well as running your home." "Although I have seen suggestions that the car may end up being used as a mobile battery instead." Again we already have mobile batteries, they're called battery electric vehicles, and they can be cheaply refilled at hundreds of DC fast charging stations, thousands of AC charging stations, and millions of regular outlets. You can easily make the electricity renewably yourself. HFCV is an inefficient battery you can only refill at less than a dozen stations, and at great expense if it weren't for the free fuel the manufacturers are giving away. Only repeating what I read as presented by the manufacturers. The ultimate goal should be for homes to generate power on site independent of the grid whether through solar, wind, hydrogen or another method. It's incredibly expensive, slow and there's less places to fill up than I have places to refuel an electric car in my house alone. Oh and the local garage could never repair this complicated piece of junk. But best of all for a test Autocar don't mention running costs which from previous posts I've made works out to twice as a diesel. Oh and so much for the range benefit over an EV, the new Zoe is edging past 200 miles. Face it Hydrogen fan boys the argument is lost, it's over. Where's the mpg equivalent figure Autocar, 35'ish? How about a feature on the hydrogen fuel cycle for these cars - where it comes from (Oil) and what the actual mpg equivalent and emmissions are once the extraction, processing and storage losses of the hydrogen are included? Imagine a coastal area of the world where's there's abundant power; wind, wave, solar. Use that power to crack sea water and extract hydrogen. Put hydrogen in a pipeline and send to major markets, just like we do with oil and gas. Job done. Why a nascent developing technology needs so much opprobrium placed on it's shoulders is beyond me. Seems like a good idea. Batteries may be getting better, but there are chemical and rare metal problems with them. Why not see where the technology goes? Well the battery in this hydrogen car is exactly the same power as the one in the Mk1 Leaf. Here's the MPG answer. Autoexpress had one on test in May and despite keeping the speed down did 227 miles with £56 worth of Hydrogen (5.6kg’s kilos) which works out to about 23 mpg. Way worse when petrol let alone diesel.